Blogging about commercial and residential landscaping and hardscaping services. 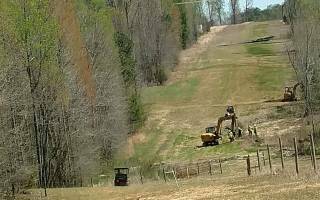 Red Oak Excavating has been helping Troy Construction on the Williams Pipeline. We are so proud of the wonderful and beautiful work that our guys are doing! Way to go team! One of the crews at Red Oak Excavating is currently working on cleaning up a pond in the Grassy Creek area! Ponds are one of our favorite things to work on as they can add so much to your property. We hope you all have a great weekend! The Red Oak Excavating crew was busy at work laying down sod for a home in Clarksville, VA. Here you can see the step by step process of getting this project complete. What started out as red dirt turned into a gorgeous ready to relax in yard! How do you all think it turned out?? With the dry season approaching, now is the perfect time to improve your yards and driveways. Are you tired of driving through the pot holes that the rain and snow created this year, if so we can help! If you need a load of stone or your driveway repaired, feel free to give us a call at 434-735-8595 for a free quote today! We are willing and ready to help your home shine this year! Have a great day! Red Oak Excavating just recently finished updating the Wylliesburg Tastee Freeze parking lot on Hwy 360. We love helping local businesses and residents with all of their construction needs! Memorial Day Weekend is already upon us. This year is certainly flying by. Everyone at Red Oak Excavating would like to wish you all a happy and safe Memorial Day Weekend. We ask that you please remember the reason behind this holiday and continue to pray and support those who have fought and still fight for our country and our freedom every single day. God Bless & Enjoy the weekend! Red Oak Excavating has a 4 man crew hard at work in Blacksburg, VA working on new Dairy Barns being built by Virginia Tech. This has been an exciting project for us. We have enjoyed working alongside the crew with English Construction and building a working relationship with them. Please enjoy some pictures of the work we are doing there. Red Oak Excavating recently completed a project in Chase City, VA for the West Third Street Community Improvements Project. We installed new water line and sanitary sewer and upgraded the storm sewer and lowered the center line profile of Third Street and placed the curb and gutter and paving. We were very proud of the work that we did for the Town of Chase City. Please enjoy a few pictures of our equipment and crew while the work was in progress. Red Oak Excavating is excavating at Trout River Dry Kilns for their new dry kiln pads in Crewe, VA. The project has progressed smoothly. Red Oak Excavating is looking for experienced heavy equipment operators for bulldozers, trackhoes and motor graders. Apply in person Mon-Fri 8 am - 4:30 pm. You can download an application here. Red Oak Excavating is looking for experienced Class A CDL Lowboy/Dump Truck driver along with construction experience. Position requires individual to work at job sites along with operating equpment. Apply in person Mon-Fri 8 am - 4:30 pm. You can download an application here. We are building a wetland detention basin to improve water quality for the storm runoff at Ft. Pickett. Our employees started building a dam this week. Welcome to Red Oak Excavating! We are so excited to be launching our new site! Stay tuned for the latest news about what we've been up to!